My children found this package of toaster pastries at Trader Joe’s, purveyor of healthier food than your average grocery store. 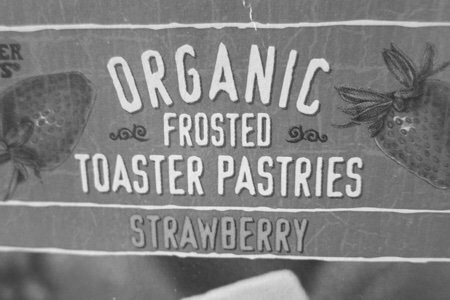 Go ahead, Trader Joe’s, wave the wand of “organic” on a PopTart and see if you can make them into a decent breakfast food. You could spray kale on these babies and it ain’t gonna make a difference. They have almost 4 teaspoons of sugar! I can’t tell you how many foods that I see with an “gluten-free” or “Non-GMO” that are essentially the same nutritionally as their gluten-filled packed with GMO counterparts. I saw some non-GMO potato chips that had almost the same nutritional information as Lays but cost twice as much. Do not get confused by bold statements on the front of boxes. Ignore the front of the food and look hard at the back for the TRUTH about the product you are buying. Corporations can say almost anything they want about the relative health of a food but most of the marketing is simply marketing. Have you seen any foods that make your blood boil? Please share. Statements of "Gluten-free" and "non-GMO" have nothing to do with how healthy the food is. They simply tell you what is not in the product for those people that are trying to (or have to) avoid them. They have been embraced by the public as "healthier" options, but they aren't necessarily and don't claim to be. The same goes for "organic" products. It has nothing to do with the nutrition facts - it simply means that the ingredients were grown or created without synthetic pesticides or synthetic additives. People think they are healthier because those chemicals aren't there, but that doesn't mean they are nutritionally any different. And by taking ingredients like wheat out, they have to replace it with something else that will fill a similar role. For those people that are allergic to gluten, they might want a product that tastes similar to the original but that they are actually able to eat. I have to admit I'm confused about this one. An organic or non GMO label really doesn't imply better nutritional stats. It's really just indicative that the ingredients are organic or non GMO. We've all learned this lesson after years of reading labels right? I'm an admitted fan of Trader Joe's and shop there regularly not because I necessarily expect the food to be healthier however, although some of it may be. So, I guess it depends on whether or not organic/non GMO is important to you. Either way we can't assume that these labels automatically mean better stats. So while your premise is correct, your surprise is a surprise to me. All of that said however I know that a lot of people think that these labels mean that the food is inherently healthy so kudos for pointing out the misconception. "Natural" foods.....it means NOTHING and misleads people who are not aware of how worthless that word is when applied to food items. "Organic"foods......also misleading. For most foods, it doesn't matter if it is organic. People pay more for organic cookies, etc., when it is just plain silly. It is great to have labels to read though. For most of my life, the companies were not required to post ingredients, and we were left to just guess what was in it and how many calories, etc. The restaurants really need to get on the ball and list the ingredients and calories, etc. for all of their items. I totally change my menu choices when I can determine if the foods are healthy or unhealthy. The things that we assume are low calorie often have hundreds of calories added by the cooking process. It's too bad that the government has to force companies to provide this information, but that is how it is and we should be grateful. Ignorance is NOT bliss when it comes to food and health. When I read "organic" I do not translate it to mean healthy, just made with ingredients that are free from synthetic pesticides. Having said that my kids are in their 20's, so I am no longer battling with kids at the grocery store. I personally (SO SORRY- but it's true!) love the taste of a warm strawberry PopTart, it reminds me of my childhood. But I think of it as junk food, pastry, or dessert - a once a year indulgence - not a breakfast option. Like many other claims written on your grocery store items (fat free, sugar free, whole grain, natural) the organic label slapped on prepared or processed foods does not equal healthy. Trader Joes has cookies, cakes and smoothies, too, and some of them are also made with organic ingredients. Doesn't make it healthier, just less questionable...sometimes. The only way around that is make it yourself. The only way around that is make it yourself, or weigh what's acceptable vs what isn't. Non GMO, Organic - so overused. Those lables do not mean much. I thought "Organic" foods were better for you because of no synthetic pesticides. If you have two boxes of spagetti, one is regular(whole wheat) and one is organic(whole wheat), isn't it better to pick the organic product? I have learned through the years to never trust the package front. It's all marketing to make you buy the product. It may be "organic" or "natural" or "non-gmo", but that doesn't make it a healthy option. Companies know all the buzz words and use them to fool people. Years back when everything was "non-fat" my mom would buy all the non-fat versions of foods thinking it was healthier. But, when you look at all the chemicals (and sugars) they put into foods to replace the fat, it looks more like a science experiment. Since we all want to eat healthier, we believe that the lastest fads ARE healthier, so when the ad campaigns jump on the band wagon, we believe them. But, a PopTart by any other name is still a PopTart. I'm not sure why this makes you angry. I don't see on the TJ's toaster pastry label you show that it says "healthy" anywhere. Trader Joe's offers all kinds of healthy food, but also organic and gluten free versions of the not so healthy stuff. Yeah, an organic "pop tart" is healthi-ER than non organic because it is made without chemicals but it isn't HEALTHY. If the label said "healthy" on it, then THAT would make me mad. If people thinkg that organic and gluten free always mean healthy, then they don't know what those words mean. If they care, then they should do their homework. That's what I had to do. Ok...off my soap box! LOL! Oh.. and I meant to say in my comment above that organic is made without "certain" chemicals. There are some chemicals that are in organic food--just not pesticides and herbicides. At least you have a Trader's Joe near you. Unless I pick the fruit or vegetable myself, I don't consider it organic. It appears that companies place organic on a box to raise the price. Personally, "organic" and "toaster pastries" don't belong it the same category. If one wants to have a sugary, warm toaster pastry treat, I would go ahead and have the nonorganic Pop-Tart. My guess is that these "organic" pastries are disgusting and a waste of money. I agree with some of the others here - this does not upset me. If I was going to buy pop tarts I'm glad to have an option that was grown without pesticides. But that is not all - no artificial colors, no HFCS, no trans fats, no nasties that the regular brand would have, which I why I love Trader Joes! Margaret--I LOVE my Trader Joe's and it is only a mile from my house! Agreed, Susan! It's not just the pesticides, it is all the other bad stuff in conventional grocery store food. I feel I have such better choices at stores like Trader Joe's. And, if you don't like anything you purchase in their store for ANY reason, they will take it back and refund your money. Even if you just don't like it. 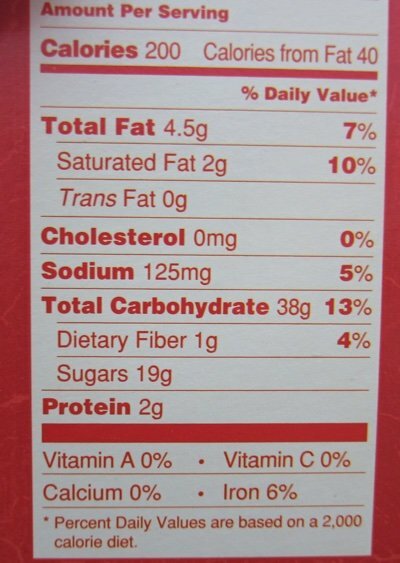 I have read labels ever since nutritional labels came out. I am not skinny by no means, but look ma lot better than most women my age, 73. Anyway, I feel that has made a big difference in the way I look and feel. Cereals for instance; 99% list sugar as the second ingredient even though they claim to be whole grain. Even the organic ones. You just can't be TOO label savvy these days. Personally, I don't shop at TJs - treats at eye-level on practically every aisle is something I need to avoid and the fact that they are marketed that way makes my blood boil. I definitely do not need to have a favorite TJ treat! I agree with comments of those who stated that the term organic is not synonymous with healthy. There is so much media debate on whether organic products are healthier which is what makes my blood boil...I choose to purchase organic products because I do not want chemicals, pesticides etc in my home, food or in our environment. If more people voted with their $$ at the grocery store & buy organic to promote a healthier world, organic prices would come down. So even if its an "unhealthy" item, I would prefer people still bought them to get these chemicals/pesticides out of our environment.